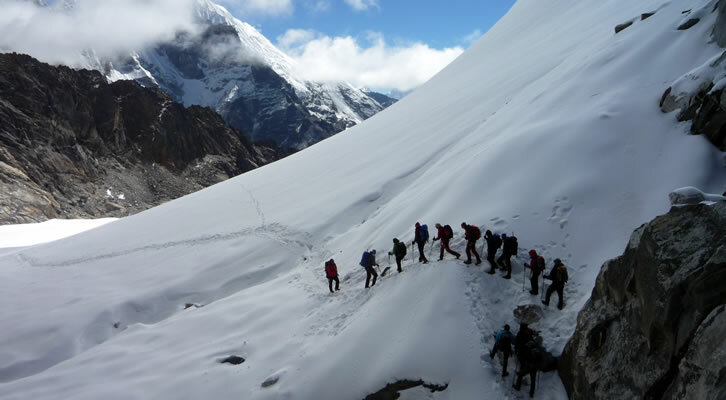 For the fit trekker with enough time, the most interesting approach to Everest Base Camp is via the Renjo La. This is a small pass that links the Bhote Kosi valley with the Gokyo valley, the valley of sacred lakes. In early 1950 an Everest training and reconnaissance expedition, led by British John Jackson and supported by local Sherpas, were tracking a snow leopard that had attacked their yaks the previous evening. The snow leopard led them up a hill, past a small lake and through a gap in the rocky peaks, a route even unknown to the local Sherpa people. Originally named, ‘The Pass of the Snow Leopard’, it was later changed by the Japanese to the Renjo La. The Bhote Kosi valley, also known as the Thame valley, is the main trail leading to Tibet. At both the beginning and the end of the season caravans of yaks carrying heavy loads, and decorated with brightly plaited manes and tails, can be seen going up and down the valley lead by their wild-looking Tibetan herders heading either into Namche Bazaar or home via the Nangpa La. A stay in Thame offers you an opportunity to visit the home of the famous Tenzing Norbu Sherpa, the first climber to scale Everest along with Ed Hillary, Thame is also the home of Appa Sherpa who has successfully climbed Everest the most number of times. One can also visit the tiny monastery perched high on the hillside. 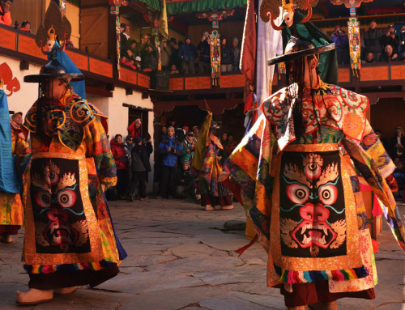 This monastery is still very much as it was originally built several centuries ago. 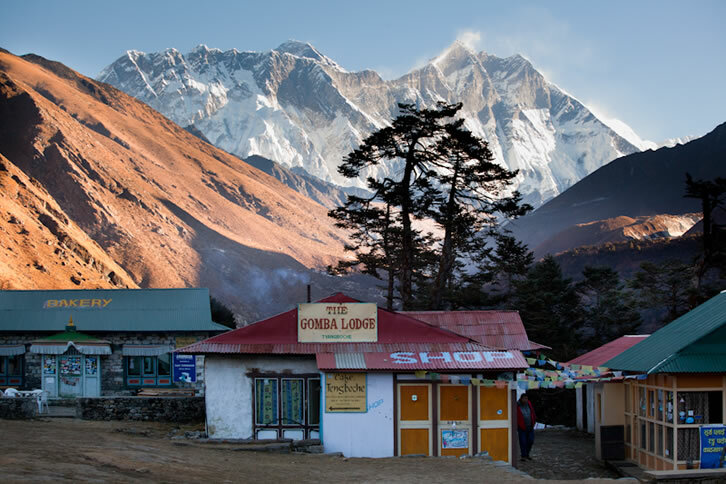 The serenity and mountain vistas experienced at the Gokyo Lakes combined with the breath taking views from Gokyo Ri, are unique and mesmerizing, many consider this vantage point to give the best views of Everest. Hindu followers believe that it is here in these sacred lakes where mother Parvati, beloved consort of Lord Shiva, used to take holy bath to transform herself from Kali to Gauri after slaying demons. Thus, it is believed that even touching or sprinkling water of any of these lakes on the head and body is good enough to cleanse the sins of a lifetime. DAY 3: Fly to Lukla and trek to Monjo (2,835m) or Phakding (2,640m). DAY 8: A day in Dingboche for rest with an optional acclimation walk to Dingboche Ri. DAY 9: Trek to Chhukung Village and hike up to Chhukung Ri (5,550m). 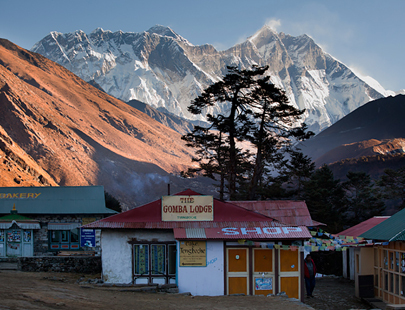 DAY 11: Trek to Gorak Shep (5,180m) and climb to Kala Patar (5,550m) for Everest and sunset views. 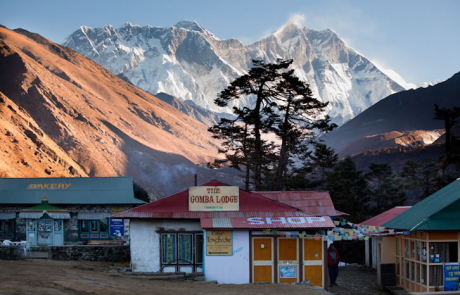 DAY 12: Hike to Everest Basecamp (5,365m) and trek to Dzonglha (4,830m). 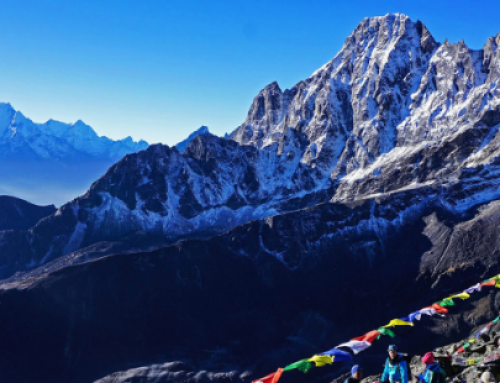 DAY 13: Cross over the Chola Pass (5,370m) and trek to Gokyo Lake (4,770m). DAY 14: A day in Gokyo Lake with an optional walk to 5th Lake and Gokyo Ri (5,370m). 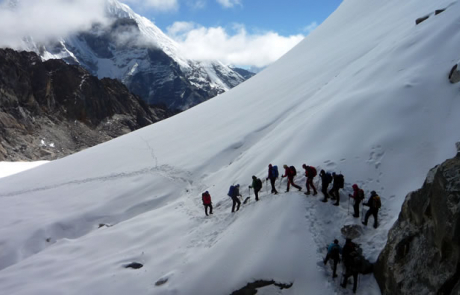 DAY 15: Cross over the Renjo La Pass (5,420m) and trek to Lungdhen (4,300m). DAY 16: Trek to Namche Bazaar (3,440m). DAY 17: Trek to Lukla (2,840m). DAY 19: A contingency day just for incase. DAY 20: Transfer to the Kathmandu Airport for the flight to home.